Complete the final stage of cleansing, help your skin find its balance and prepare your skin to accept rich moisture with unique Nutriance Toners! Refreshing, alcohol-free Refining Toner 1 (for normal-to-dry skin) soothes and tones as it removes final traces of drying debris. Selected botanicals awaken skin’s natural self-correcting abilities by gently energizing production of skin’s protective lipids to enhance moisture balance. Stimulating, alcohol-free Balancing Toner 2 (for combination-to-oily skin) removes surface impurities and is clinically proven to help calm lipid production and help pores appear smaller. Both Toners contain Green Tea and Echinacea to provide antioxidant and immune support. You can also enjoy either Toner as a refreshing after-shave splash! To complete the final stage of cleaning; no single facial cleansing product can do the whole job. To remove any remaining residues and impurities; especially helpful at the hairline. To soothe and tone the skin and to conclude the cleansing process with the skin feeling firm and refreshed. To prepare the skin surface for moisturizing and protection from the elements. Why Nutriance Refining Toner 1? Ingredients: Water, Propylene Glycol, Coneflower Extract, Green Tea Extract, Avocado Oil, Orange Flower Extract, Euphrasia Officinalis Extract, Ivy Extract, Sweet Almond Extract, PEG-40 Hydrogenated Castor Oil, Diazolidinyl Urea, Methylparaben, Fragrance, FD&C Blue No. 1. Mild toning formula cleans away the final traces of normal-to-dry skin surface impurities and residual cleanser, as it soothes and refreshes. Skin’s natural lipid production is encouraged and the oil-to-moisture ratio rebalanced with a unique combination of botanicals (Orange Flower Extract, Eyebright Extract (Euphrasia Officinalis), Ivy Extract (Hedera Helix L.), Sweet Almond Extract). Alcohol-free formula prepares the skin surface for moisturizing and protection without any sting or discomfort. Promotes skin’s elasticity with pure Avocado Oil. Delivers Green Tea and Echinacea Extracts for antioxidant and immune support. Provides the third step of the Nutriance Synergy Cycle for normal-to-dry skin; a complete skin care programme in five steps. Each step builds upon the last. Step Three leaves your skin refreshed and rebalanced. Water soluble formula helps maintain a healthy skin surface pH. Clinically proven performance, verified in Europe’s most prestigious dermatological research facility. Subtle fragrance virtually disappears upon application. Unique personally adaptive formula interacts with your body’s natural pheromones and blends with your own personal chemistry to become essentially invisible to the nose. Will not conflict with your favourite fine cologne	or perfume. 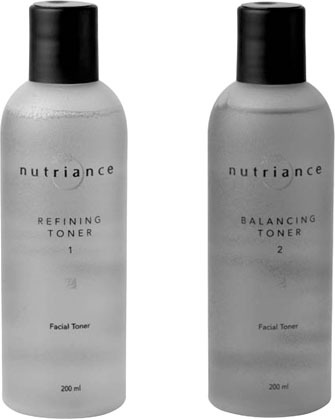 Why Nutriance Balancing Toner 2? Ingredients: Water, Propylene Glycol, Coneflower Extract, Green Tea Extract, Witch Hazel Extract, Tormentil Extract, White Oak Bark Extract, Sage Extract, PEG-40 Hydrogenated Castor Oil, Diazolidinyl Urea, Methylparaben, Fragrance. Gentle astringent toning formula cleans away the final traces of excess surface oils and residual cleanser, as it soothes and refreshes combination-to-oily skin. Natural botanicals help shrink the appearance of pores and blemishes. Alcohol-free formula prepares the skin surface for moisturizing and protection without any sting or	discomfort. Provides the third step of the Nutriance Synergy Cycle for combination-to-oily skin; a complete skin care programme in five steps. Each step builds upon the last. Step Three leaves your skin refreshed and rebalanced. Subtle fragrance virtually disappears upon application. Unique personally adaptive formula interacts with your body’s natural pheromones and blends with your own personal chemistry to become essentially undetectable to the nose. Will not conflict with your favourite fine cologne or perfume.